The plot of Panorama Island is not nearly as engrossing as the Maruo’s illustrations. This is one of the most beautifully drawn books I’ve encountered. 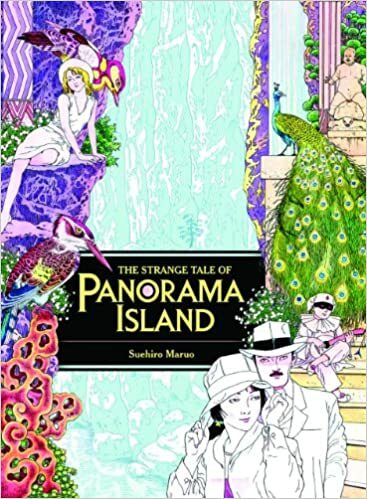 With lots of large illustrations of the island and the performers who live on it, it’s a quick fluffy read that’s not entirely unsatisfying. Surreal and original! this novel is not shy to expose the naked elements of the human soul warts and all, as well as naked form the human body. In an odd way i feel the best effect this book had on me was an exploration of the flaws involved with hedonism centered around an individuals purchasing power. I love the aesthetic role of the islands various marvels. The protagonist is a scummy terrible person which i find makes it all together fascinating, providing a glimpse into the psychology of someone who i entirely do not relate to is an exercise for my brain. Overall i found this book to be a treasure of literature and a novelty of writing and illustration.